You know those moments where you enter a room and totally forget why you even went in there? We all have our own possible reasons for this, but I think the most obvious one is when you walk in on something really distracting happening in that room. And before some of your minds nestle comfortably in the gutter, I mean that you'd definitely forget what you wanted if any of these wild things crossed your path. 1. They may not be healthy for you, but I have to hand it to the happy meals. They live up to their name to the end. I'm sure someone burned this one because it started laughing, but the point is that nothing can bring it down. 2. 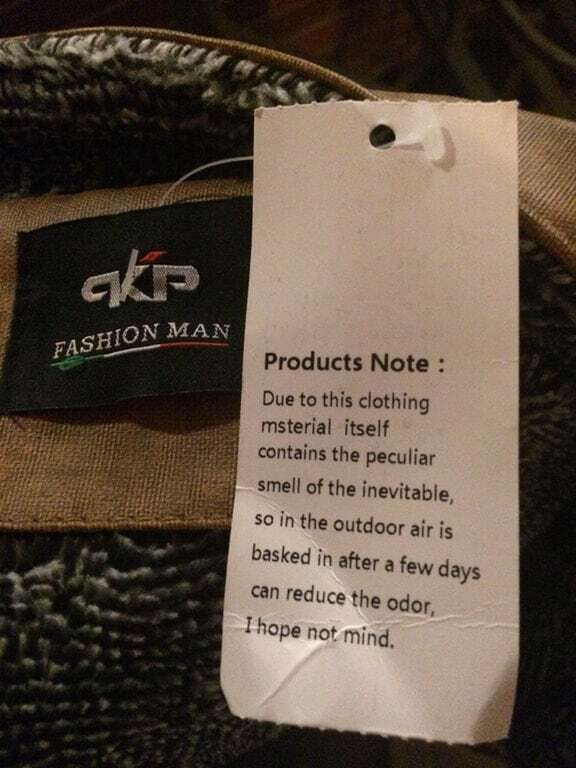 This note is probably just saying the garment smells kind of funny, which actually makes it kind of brilliant. After all, people will be way too nervous about what "the peculiar smell of the inevitable" could possibly mean to even mind the actual odor. 3. I think I would have a better idea as to why this kid is squatting there if I knew what was in his hand. It kinda looks like a birthday card, which really makes me doubt that whoever this is for is gonna like the surprise. 4. Uh...is the guy in the toilet trying to help the person in the tub, or is it the other way around? Regardless, I think figuring out how he got in there is impossible. All I know is that even an alligator would be more welcome than this. 5. 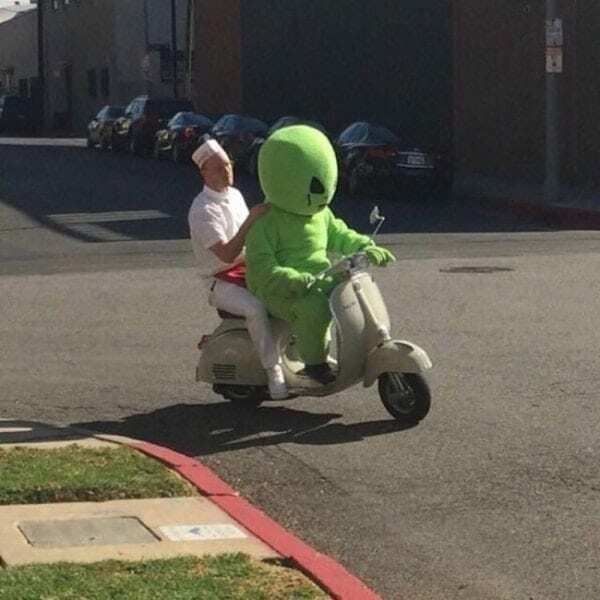 Look, I have nothing against taking a ride in your alien suit, but I would at least recommend letting the sushi chef — or whoever that is — drive. I just don't have a lot of confidence that the head piece offers much visibility. Safety first. 6. This thing would still look kinda creepy if it were sparkling clean, but it's somehow even more unsettling now. No, Fry Guy, it's not OK. You're either eating or trying to smoke a part of yourself. And why don't your shoes have any laces? 7. I don't wanna know what made someone so mad that they made this, but I'm really glad they don't have it anymore. And the fact that this pool ball kind of reminds me of a Waddle Dee from the Kirby games isn't helping. 8. Yup, a simple cost-benefit analysis will tell you that this is definitely the way to go. After all, if there's anything in our lives cheaper than rice, it's phones. Oh...actually, please disregard that. It turns out I had the chart upside down all along. 9. The only thing I can figure here is that the dog stole her glasses — but it's not like it can put them on, right? I realize that I can't see its eyes, but even the dog seems to be wondering what the problem is here. 10. Uh, sure. 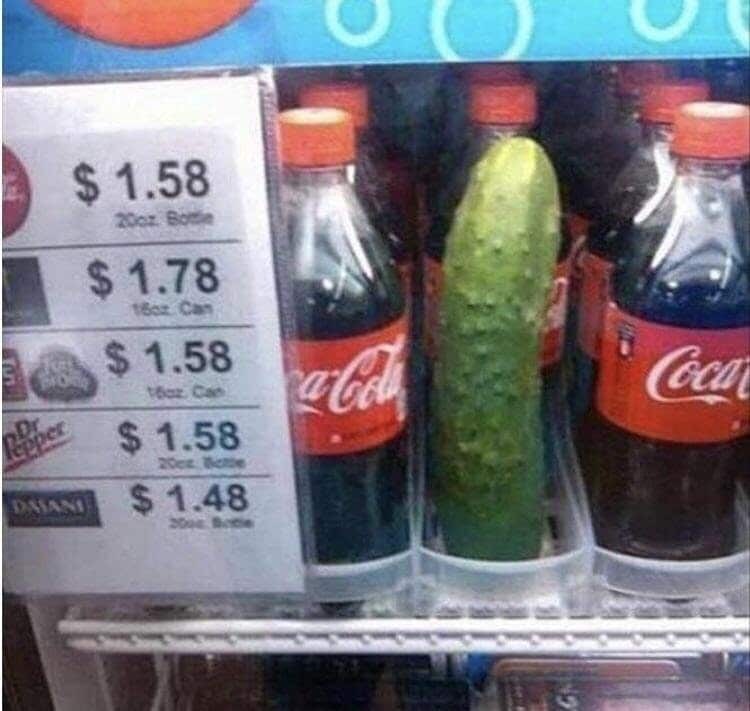 I guess I can see how a juicy pickle would be as refreshing as a cool bottle of cola. I don't think that gets us any closer to answering how or why it got in there, though. Still, somebody will probably buy it. 11. Speaking of pickles, I think I might actually understand what's going on here, believe it or not. 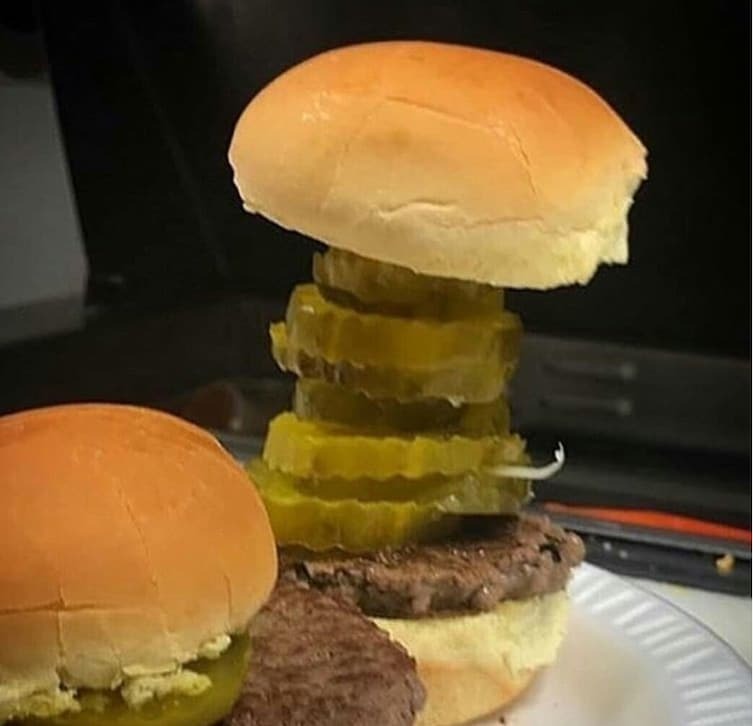 When everybody takes the pickles off their burgers, they have to go somewhere, right? Somebody was obviously generous enough to give the foundling toppings a good home. 12. It took a long time to figure out that these two are being potato heads, but that's about all I can tell you about this. I can't fault the girl for ignoring them, though. One look at those nightmares would definitely keep my mind on my work. 13. 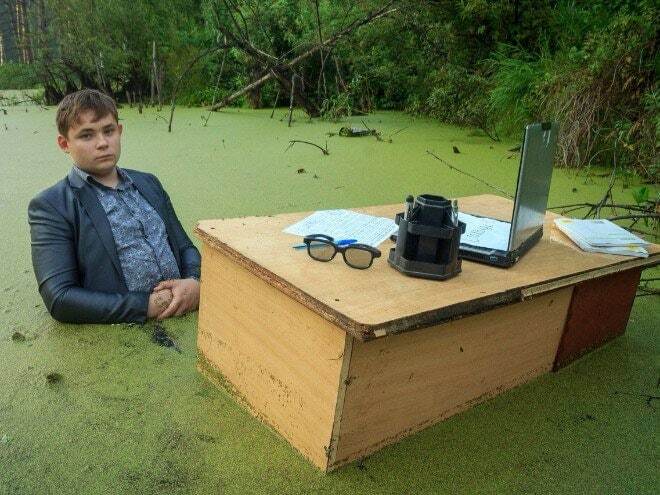 So, did this person go to all of this trouble just to make a "swamped with work" pun? Like, they don't even seem to be enjoying it. Was it not worth the smell and the effort of lugging all of this stuff in there? 14. This looks incredibly uncomfortable for everyone involved...and even some of us who aren't. I don't think there's a "good" spot to be in here, but I think it's safe to say that the worst position is the one getting stuck at the bottom of this monstrosity. 15. I'm almost afraid to ask, but is this somebody's idea for replacing the K-9 unit or what? I can't believe I'm saying this, but I can see it working. They may not be as fast as dogs, but a fleeing suspect definitely won't be expecting them. 16. It may have been a difficult separation, but on the plus side, at least the driver won't have any trouble finding a parking space. That's probably not much of a trade when you factor in the part where they get pulled over every 10 miles, though.